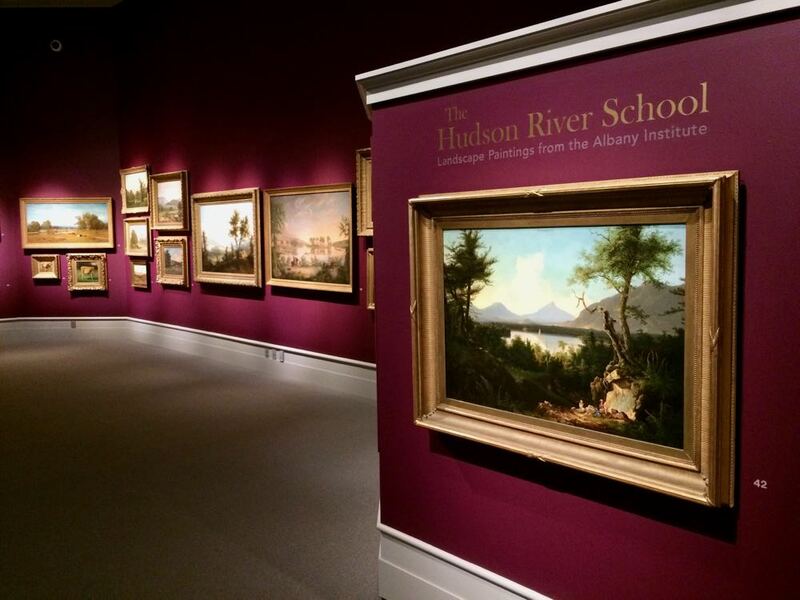 The large Hudson River School exhibit at the Albany Institute. It can be great having friends and family around for the holidays. But sometimes after all that visiting people need to just get out of the house. So... maybe take them to a museum, where people can spread out, have some time to their selves, and see some new things to talk about. This is not a comprehensive list of every museum around this are (there are many). If there's one that you think would make a good visit this time of year, please share! The New York State Museum recently opened an exhibit of works from the Woodstock Art Colony, part of a large donation of pieces made to the museum last year by the collector Arthur A. Anderson. The exhibit includes works by artists such as Birge Harrison, Konrad Cramer, George Bellows, Eugene Speicher, Peggy Bacon, Rolph Scarlett, and Yasuo Kuniyoshi. The State Museum also not too long ago opened the second portion of its Enterprising Waters: New York's Erie Canal exhibit. And don't miss the Cornplanter Pipe Tomahawk that's on display through the end of the year. Also: When was the last time you and your crew have seen the Cohoes Mastodon? It's probably been too long. The Albany Institute closes Thomas Cole's Paper Trail the weekend after Thanksgiving. And two animal-themed exhibits -- Birds & Beasts: The Scary, Magical, and Adorable Animals of the Albany Institute and A Menagerie of Whimsey: The Art of William B. Schade -- close at the end of the year. Bu if you and your family and friends haven't been to the Albany Institute in a while, you've gotta check out the museum's extensive Hudson River School collection, almost of all of which is now on display in a refurbished gallery. And the weekend after Thanksgiving is free admission. + The 2018 Screenprint Biennial is on display at the Opalka Gallery on the Sage Albany campus through December 14. + The 2018 Artists of the Mohawk Hudson Region exhibit is on display at the University Art Gallery on the uptown UAlbany campus through December 8. MASS MoCA is a literally huge museum that's worth the trip over the hill to North Adams, Massachusetts. If you haven't been there in a few years, there's a new (big) building open. And the Sol LeWitt installation is great. Also in Western Massachusetts (Williamstown, specifically): The Clark has a remarkable collection of French Impressionist works and the works of American artists such as Winslow Homer and John Singer Sargent. The Clark currently has an exhibit called Extreme Nature!. "Looking largely to artistic representations that incorporate scientific observation and study, this exhibition explores how depictions of distant landscapes, tumultuous atmospheres, and natural disasters--some documentary, some invented, and many a fusion of the two--enabled viewers to reimagine the boundaries of the world around them. " The Norman Rockwell Museum -- just over the border in Stockbridge, Massachusetts -- exhibits of Rockwell's works (as you'd expect). It also has Frank E. Schoonover: American Visions on display. The Hyde Collection in Glens Falls includes the works of many famous artists. And if you haven't been there a while, the Feibes & Schmitt Gallery -- with modern art collected by Schenectady residents Werner Feibes and the late James Schmitt -- might be new to you. A baseball fan could probably spend a whole day at the Baseball Hall of Fame in Cooperstown, which is about an hour and a half from Albany. Also in Cooperstown: The Fenimore Art Museum. Its collections include Native American art, American fine art, American folk art, and photography. It also has two exhibits on display through the end of the year: Winter Warmth: Coverlets, Quilts, and Clothing and Puzzles of the Brain: An Artist's Journey through Amnesia. Another museum you might want to make a day trip out of: Dia:Beacon, which includes a large collection of modern art in a former Nabisco box printing factory. If you like MASS MoCA, you'd probably enjoy Dia:Beacon. Also, you can take people to the observation deck of Corning Tower. It's free! Black Friday is the only day of the year when state offices are open while my employer has a holiday. This area is blessed with many art museums all within an hour and a half. Treat yourself and surely go to one of them. Not included was the Munson Museum in Utica, another great museum to visit. And shout out to our local libraries - many have museum passes available for you to "check out" = free admission!